Top: Brooke Fehily, Dr Kelly Walton, Dr Sarah Larcombe. Middle: Dr Alexandra Grubman, Dr Celeste Donato. Bottom: Pippa Iva, Dr Jennifer Payne. The future is exciting. Everyone has a part to play, and balance drives a better working world. 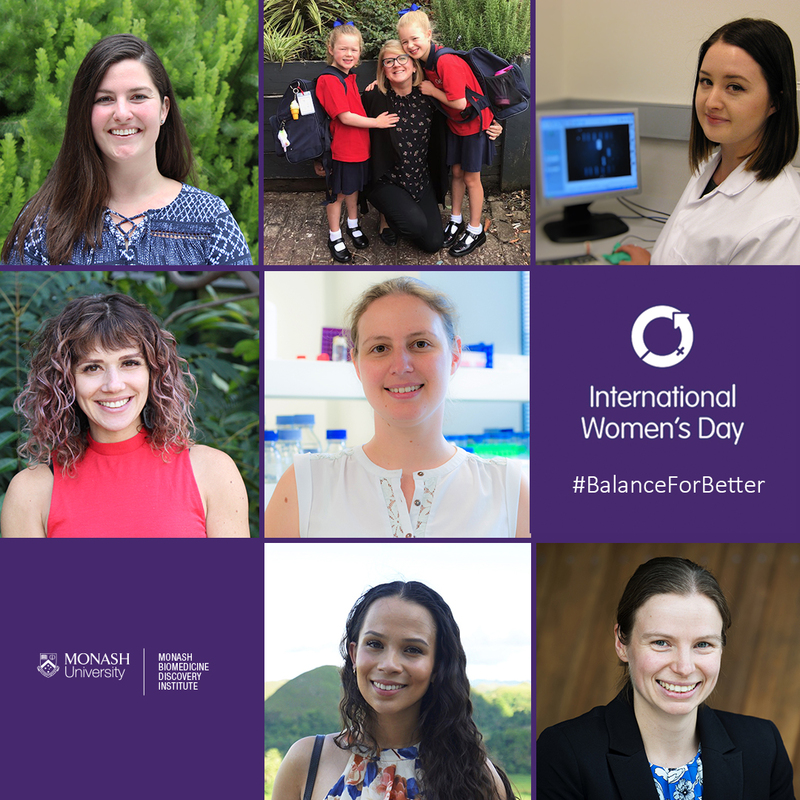 Balance for better is the theme of this year’s International Women’s Day: we celebrate the social, economic, cultural and political achievements of women - while also marking a call to action for accelerating gender balance. 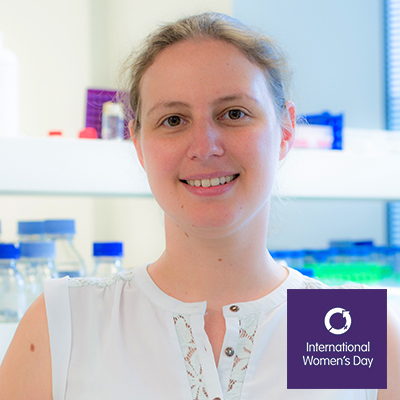 Here at the Monash Biomedicine Discovery Institute (BDI) there are hundreds of amazing female scientists working on ways to prevent, diagnose and treat disease. They are tackling the big questions in biomedical research. 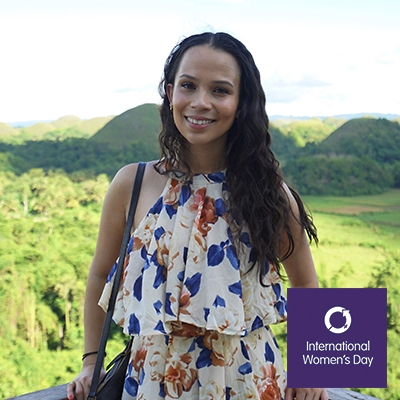 Today, we’d like to share the stories of a few of our #WomenInSTEMM. This busy group of researchers took some time out this week to visit local secondary schools, to talk to students about their career journey, role models, advances in science since they were teens, and what makes them optimistic about the future of gender equity in STEMM. 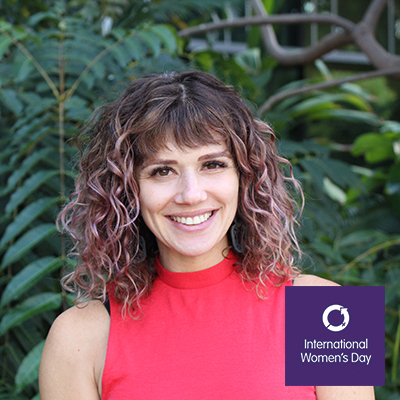 Dr Donato is an early career researcher in the Dhanasekaran lab, studying the genetic diversity and evolution of rotavirus strains in Australia following vaccine introduction. I was really fortunate to meet Professor Nancy Millis when I was an undergraduate student. She was the first distinguished female scientist I met and passionate about encouraging female students to pursue careers in microbiology. My role model for the last ten years has been Professor Ruth Bishop who founded the lab I did my PhD in and has made incredible contributions to the field of virology. I was so fortunate that she was still coming into the lab on a regular basis during my PhD (despite being in her eighties) and she continues to be a source of inspiration for me. I had wanted to be a scientist since I was in primary school. I never considered a career that wasn’t science-related. I had some negative experiences in high school that made me feel like certain branches of science were not open to me. I can remember my Year 11 physics teacher claiming he “didn’t know how to teach physics to girls”. At the end of my degree I still wasn’t sure what I wanted to do as a career, but as soon as I started Honours I knew I wanted to be in the lab. I really enjoyed the collaborative environment and became passionate about my area of research. I remember learning a little bit about sequencing and the Human Genome Project when I was in VCE as the first draft had recently been completed. The advances in sequencing technology since then have been incredible. I think there is a lot to be positive about when it comes to gender equity in STEMM now and into the future. There is a conscious effort to address gender bias in STEMM and the impact is already evident. There are many amazing programs for school students to get involved in STEMM subjects and I really wish these had been available when I was a student. The idea of ‘male dominated fields’ is slowly being eroded and hopefully that continues as the barriers to gender equity are addressed. 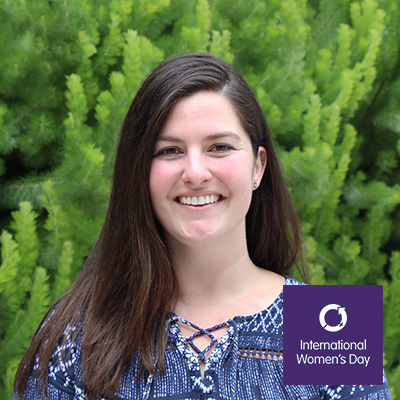 Brooke is a PhD candidate in the Polo lab, researching the mechanisms underlying the loss of somatic identity during cellular reprogramming. I have worked in the healthcare industry for 10 years as a Physiotherapy Assistant, Pilates Instructor and Personal Trainer. During this time, I completed my undergraduate degree where I majored in both neuroscience and sport science. I completed my Honours in the field of neurotrauma before relocating to Melbourne from Western Australia to conduct my PhD studies in cellular plasticity for regenerative medicine. I have always looked toward everyday people as my role models, ranging from colleagues, teachers, supervisors, friends and family. I always strive to learn from people who are kind, honest, intelligent and those with a strong desire to advance the world in their own unique way. When I was a teenager, I thought my only career options were to become a lawyer, doctor or veterinarian and none of those options appealed to me when I really thought about them. I didn’t even know it was possible to have a job in science apart from being a science teacher. I began my undergraduate degree out of pure interest. However at that point, I still didn’t really think I could build a career in science and I wasn’t aware of what that might look like. It wasn’t until the last year of my undergraduate degree, when I was learning about neural plasticity in one unit and conducting a small research component in another that I realised research in a niche area of my choosing was very possible. Once I realised this, I felt more confident in building a career out of things that I love and am interested in. When I was started high school the first draft of the entire human genetic code was unveiled by the Human Genome Project, and since then research in this space has advanced exponentially. Dr Grubman is an early career researcher studying the molecular mechanisms that govern cell identity in Alzheimer’s disease in the Polo lab. I was born in Ukraine and came to Australia as a kid with my parents. I think I wanted to be a scientist since I was about 10 – at first an astronomer, then a marine biologist – I was always interested in how the world worked. According to mum, since I learned to talk, I always asked a million questions and always had some theories handy. My four year old is the same – his latest theory on Alzheimer’s Disease is that bacteria infect the brain and cause our cells to change their genes, which makes them lose their memory. My PhD research was on bacteriology – looking into what allows Helicobacter bacteria to colonise the stomach whereas other bacteria cannot survive there. During that time, an important role model was Bonnie Bassler. She deciphered a secret language that bacteria use to talk to each other to work as a team. She discovered this bacterial chatter as part of a symbiotic relationship between a squid and its bacterial passengers – they talk to each other and co-ordinately light up, a phenomenon the squid uses for camouflage. This is an exciting discovery with an important clinical application – stopping this chatter may silence ‘superbugs’ without enabling them to evolve resistance to antibiotics. I’ve always been curious in a philosophical sense about the mysteries of learning and memory, and after my PhD I wanted a new challenge and a new direction to which to apply my skills. Apart from being a super important problem to solve as it affects so many patients and carers, there are so many fascinating questions to ask in Alzheimer’s disease – there is still so much we don’t understand about how the progressive memory loss occurs and ultimately how we can prevent or reverse it. Ben Barres, the “godfather of glia”, was also a scientist that inspired me. He said that "Ninety-nine per cent of neuroscientists work on one per cent of the interesting questions. It is so much more exciting to work on the untouched mysteries!” He worked to open the field of non-neural cells in the brain. Aside from being a phenomenal scientist, Ben Barres was also an advocate for the importance of generous mentoring and for gender equality in science. He had a unique perspective on this, as he was born Barbara Barres and transitioned in 1997 after already having a stellar scientific career and making important discoveries. He often discussed and wrote about the differences that he felt first hand as both a man and a woman in science. We live in an exciting time where science moves at an extraordinary pace, and I feel privileged to have the opportunity to be a part of it! 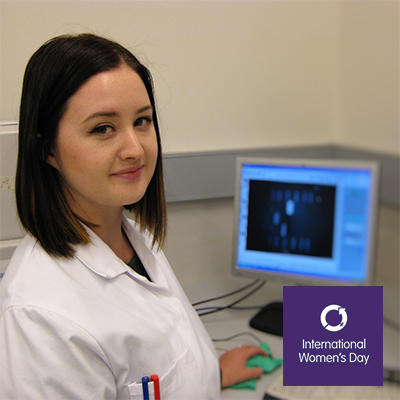 Pippa is a PhD student studying speech discrimination abilities in individuals with multiple sclerosis in the Rajan lab. Attending an all-girls school in Berwick, I was fortunate enough to be surrounded by strong female peers from an early age. I went on to complete a Bachelor of Behavioural Neuroscience with Honours at Monash University with a major in physiology and neuroscience, and I am currently in the third year of my PhD. My supervisor, Professor Ramesh Rajan, has been a role model and mentor throughout my research career. He has not only accomplished so much as a researcher but is also a charismatic leader and a tremendous support. Professor Rajan, along with the rest of the supervisory team, have positively shaped my professional and personal development, helping me to make more informed decisions about my career. As a naive high school student, I had a preconceived notion that being a scientist meant working inside a confined laboratory all day collecting data in a white lab coat. However, throughout my PhD, I have come to realise that this couldn’t be further from the truth, as I spend my time collecting data at hospitals where I am interacting with patients and meeting experts in their fields. I also had difficulty grasping the concept of how understanding science at the molecular and cellular level could translate into meaningful environmental and social change. My turning point arrived when I was at university and I was exposed to amazing work by my professors, lecturers and Monash alumni that influenced policy decision making. More needs to be done about the underrepresentation of women in STEMM. Women make up half of the population, so we’re missing out on half of the brightest people to solve the world’s major problems. Better ideas can be formed when teams are diverse: people of different genders, personality types, racial backgrounds and people with disabilities all bring a different perspective and ways of problem solving. 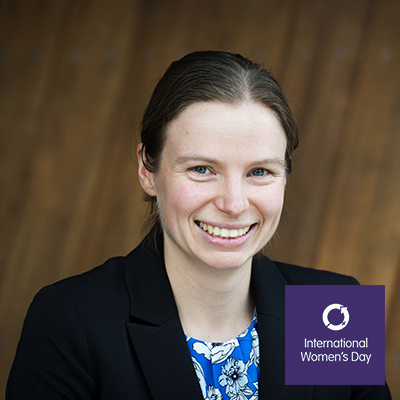 Dr Larcombe is an early career researcher investigating the gut microbiome of hospitalised patients with diarrhoea, and exploring the relationships between certain bacteria found in these patients using mouse models in the Lyras lab. 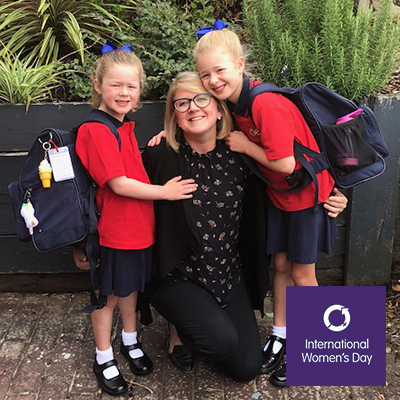 Being raised by a single mother and having four sisters, I’ve been surrounded by women my whole life, which has led me to seek female role models throughout my education. It’s one of the reasons I wanted to join the laboratory of Professor Dena Lyras when I was looking for a summer project in 2010, and she is a part of the reason why I’m still here today. Professor Lyras is a highly accomplished scientist, and a wonderful role model, mentor, and advocate for women in science. I enjoyed science in school, but never realised that ‘scientist’ was a real job that I could have. I had thought that I would like to pursue medicine, but never entertained the idea seriously because I didn’t believe that it was achievable. It wasn’t until I started a Bachelor of Business after high school that I realised that I should have pursued what I was really interested in, instead of what I thought was the safe thing to do. Transferring to a biotechnology course at TAFE and doing well there really helped me build my confidence, and I soon realised that a career in science could be achievable for me. Science news wasn’t as accessible when I was in high school as it is now, so I wasn’t exposed to a lot of what was happening in science outside of the classroom. However, the Human Genome Project began before I was even in primary school, and was completed when I was in high school. DNA sequencing technology advanced so much in that time that shortly after the human genome was completed, the Human Microbiome Project began, and was completed in just five years. DNA sequencing is now something we can do routinely, and has revolutionised the way we do science. I want young women to know that women are succeeding in STEMM, and when women succeed they empower others to do the same. Diversity and inclusion makes science better, so I hope that women and other under-represented groups will become better represented in leadership positions, and when our leadership is representative, we can achieve equality. Dr Payne is an early career researcher studying the problem of developing new antibiotics that are not just your typical annihilator in the Cryle lab. Having grown up in central Victoria surrounded by bush, I chose the bush setting of La Trobe University to complete my studies. And I’m so glad I did, as it gave me the opportunity to meet one of my role models and supervisor for my PhD, Professor Marilyn Anderson. I really enjoyed the art of science when I was a teenager. Maria Sibylla Merian and Beatrix Potter were inspirations with their scientific illustrations. But I also enjoyed the excitement of exploring something that no one else had before, being the first one to see something. I was caught up in space and space exploration. Reading about the International Space Station and the women (Pamela Melroy, Eileen Collins and Peggy Whitson) who were up in the satellite that I could spot above my head was unbelievable. I really enjoyed biology (well most of it). Having a teacher at high school that I could stump with questions – but who would then come back to me with the answer the next day – kept me on my toes, and helped to inspire me to find out more. Facebook, Gmail and Firefox all launched in the year I graduated high school, and the Spirit and Curiosity rovers touched down safely on Mars. Science and technology advance so quickly and I enjoy learning something new each day. Dr Walton is a mid-career researcher studying the TGF-β superfamily and their actions in reproductive and musculoskeletal diseases alongside co-lab head, Associate Professor Craig Harrison. Support is an integral part of success, regardless of gender. My parents have instilled me with exceptional work ethic and humility, both of which are integral to longevity in this industry. From the outset, my parents encouraged me to pursue my passion for science. My postdoctoral supervisor, Associate Professor Craig Harrison, has been a brilliant mentor, and an integral part of my success as an EMCR. The ‘light bulb’ moment for me was the news on ‘Dolly the Sheep’, the first cloned mammal. This story was released when I was in Year 10, back in 1996. It got me excited about science and what can be achieved. Since that discovery over 20 years ago, technology has really accelerated research capacity. Having these tools is ultimately allowing us to take our research from discovery to pre-clinical testing in a much shorter time frame. I like to emphasise that I am a scientist, but also a woman. Gender really didn’t come into play in my career until I had children. What I found helped most through this transition was having male and female mentors who were effectively juggling work/family life. Everyone does this differently, so learning from multiple mentors really helps you to find what will work best for you and your work/home families!